Becky is a short, thin woman who appears to be in her late 20’s but has to be at least in her 30s. 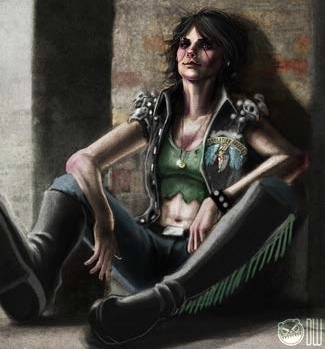 She has short, spiky, dark hair and dresses in street ganger chic, lots of black leather in the Desolation Angels colors of Black and Green. Her armored jacket is decorated by a couple of rat skulls on the shoulders, and she wears a golden ring that resembles a wedding band on a chain around her neck.